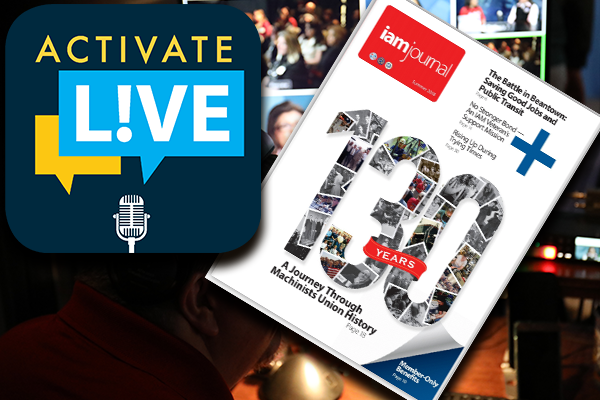 Join the IAM’s live studio webcast of Activate L!VE Wednesday, May 23 at 3 p.m. Eastern. This week’s show will include Terry Melvin, President of the Coalition of Black Trade Unionists and Jerame Davis, Executive Director of Pride at Work. You’ll get a closer look at some of the stories in the new IAM Journal, which has been mailed to the homes of every IAM member. This edition celebrates the 130th anniversary of the Fighting Machinists Union. The show will also bring you up to date on news from across the Machinists Union. Activate L!VE webcasts live each Wednesday at 3 p.m. Eastern.